This article is about the Marvel comics character. For the writer, see Daisy Johnson (writer). Quake on the cover of Secret Warriors #22 (November 2010). Daisy Johnson, also known as Quake, is a fictional superhero appearing in American comic books published by Marvel Comics. Created by writer Brian Michael Bendis and artist Gabriele Dell'Otto, the character first appeared in Secret War #2 (July 2004). The daughter of the supervillain Mister Hyde, she is a secret agent of the intelligence organization S.H.I.E.L.D. with the power to generate earthquakes. Daisy Johnson appears as a main character in Agents of S.H.I.E.L.D., the first television series in the Marvel Cinematic Universe. She is played by actress Chloe Bennet. She is reimagined as an Inhuman originally known as Skye. Aspects of this interpretation were later integrated into the comics. 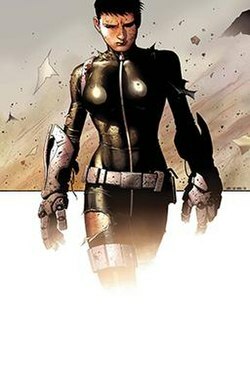 Daisy Johnson was created by writer Brian Michael Bendis and artist Gabriele Dell'Otto, and first appeared in Secret War #2 (July 2004), as a member of the international espionage agency S.H.I.E.L.D.. During the 2008 "Secret Invasion" storyline, she joins Nick Fury's Secret Warriors under the codename Quake. Her look was modeled after actress Angelina Jolie in the film Hackers. Daisy Johnson appeared as a supporting character in the 2010-2013 Avengers series, from issue #19 (January 2012) through its final issue #34 (January 2013). Daisy Johnson is a superhuman with seismic (earthquake-producing) powers, and is the illegitimate daughter of Calvin Zabo, the supervillain known as Mister Hyde. Taken in by S.H.I.E.L.D., she is under the careful eye of its longtime executive director, Nick Fury, even after the latter's defection from the agency during the events of the Secret War series. Daisy herself was a participant in this incident, where Fury used trickery, lies and outright brainwashing in order to secure a superhero team to overthrow the legitimate government of Latveria. This later resulted in a terror attack on American soil; Daisy destroys the cyborg leader. She possesses a "Level 10" security clearance, the only known agent aside from Fury and the Black Widow (Natasha Romanova) to do so. In her most visible action, Johnson has helped to defeat the powerful mutant leader Magneto by inducing a vibration in his brain that made him lose consciousness. This was during a three-way confrontation with the X-Men, Avengers and the "Collective" - a powered being carrying thousands of mutant energy signatures. Daisy states in this appearance that if she were to join the superhero team the Avengers, she would adopt the moniker "Quake". The Avengers had splintered due to the events of the 2006–2007 "Civil War" storyline and she is later seen reunited with Nick Fury, in disguise, who gives her new orders to recruit the descendants of various villains and heroes in order to assist him with the threat against the Skrulls in their Secret Invasion. Taking on the name Quake, she and her teammates attack the Skrulls during their invasion of Manhattan. The team becomes a part of Fury's Secret Warriors, with Daisy acting as field leader of the Caterpillars. While investigating Norman Osborn's escape from the Raft, Johnson is drafted by Captain America into the Avengers under her superhero name Quake. She is tasked with tracking down how Osborn appeared via hologram in the middle of a supposedly secure press conference. Daisy takes over as director of S.H.I.E.L.D. when Nick Fury fully retires and his son joins as an agent. Maria Hill is the Acting Director of S.H.I.E.L.D., while Johnson is still considered Director of S.H.I.E.L.D. Johnson was indefinitely suspended after launching an unsanctioned operation to assassinate Andrew Forson, the Scientist Supreme, leader of the supposedly legitimate A.I.M. Island. Hill is promoted to Director in her place. In the S.H.I.E.L.D. series, Daisy later reveals to her father that she has uncovered the origin of her abilities: she is an Inhuman whose genetic abilities were activated by her father's unstable DNA, rather than through Terrigenesis. The nickname "Skye", Daisy's original name from the show, is also introduced to comics as Coulson's affectionate name for her, and she is redesigned with the likeness of Chloe Bennet. During the 2013 "Age of Ultron" storyline (which took place in an alternate reality where Ultron nearly annihilated the human race), Daisy Johnson is among the superheroes in the resistance against Ultron. Quake has appeared alongside Tigra, Wonder Man, and The Vision in the Ultimate line of comics. It is later revealed that prior to becoming Quake, Daisy Johnson was a S.H.I.E.L.D. cadet who was discharged from the organization after fighting back against an attempted sexual assault from a superior. She was then approached by Nick Fury, who offered her superpowers in exchange for joining his West Coast version of the Ultimates. The project was shut down and later reactivated by a corrupt California governor who sent them after the Ultimates. Quake decided to surrender for the greater good and tell President Steve Rogers the whole plan, who managed to put an end to it along with the rest of the Ultimates. Chloe Bennet as Daisy "Skye" Johnson from the television series Agents of S.H.I.E.L.D. Daisy Johnson appears in the animated series The Avengers: Earth's Mightiest Heroes, voiced by Lacey Chabert. The character first appears as part of a secret team of heroes organized by Nick Fury to gather intel on the Skrull invasion. She later appears in the series finale as one of the heroes recruited by the Avengers to battle Galactus and his heralds. Chloe Bennet appears as a series regular in the live-action series Agents of S.H.I.E.L.D. playing a character called Skye, a computer hacker recruited into S.H.I.E.L.D. by Phil Coulson. In the show's second season, the character's birth name is revealed to be Daisy Johnson and she gains superpowers. By the end of the third season, she adopts the "Quake" moniker. Executive producer Maurissa Tancharoen confirmed the character is an adaptation of Daisy Johnson, as well as an Inhuman. On making Daisy an Inhuman for the Marvel Cinematic Universe, executive producer Jed Whedon said, "We’ve created a different origin for her... We merged those two ideas together also because there are such rabid fans out there that if we stick to original story points from the comics, they will smell story points from miles away. Those two factors led us to coming up with a different notion of how she got her powers." Bennet reprises her role in a six part web series titled Agents of S.H.I.E.L.D. : Slingshot. Quake appears in the 2018 animated feature film Marvel Rising: Secret Warriors, with Bennet reprising her role. Quake is a Team Up character in Marvel Heroes; and come with Agents of S.H.I.E.L.D costume. Quake was a playable character in the online Facebook game Marvel: Avengers Alliance. Quake is a playable character in Marvel: Future Fight; her Agents of S.H.I.E.L.D. look is included as an alternate costume. Quake is a playable character in Marvel Puzzle Quest. Daisy Johnson is a playable character in Lego Marvel's Avengers through the Agents of S.H.I.E.L.D. downloadable content. Quake is a playable character in Marvel: Contest of Champions. Quake is a playable character in Marvel Strike Force. Quake appears in Marvel Rising: Initiation (a tie-in to Secret Warriors), voiced by Chloe Bennet. ^ "Secret Wars" #1-5 (Feb. 2004 - Dec. 2005). Marvel Comics. ^ New Avengers vol. 1 #20 (August 2006). Marvel Comics. ^ Mighty Avengers #13. Marvel Comics. ^ Secret Invasion #4. Marvel Comics. ^ Battle Scars #6 (June 2012). Marvel Comics. ^ Secret Avengers vol. 2 #1 (February 2013). Marvel Comics. ^ Secret Avengers vol. 1 #5. Marvel Comics. ^ Gary Hartle (2012-05-13). "Who Do You Trust?". The Avengers: Earth's Mightiest Heroes. Season 2. Episode 033. Disney XD. ^ Roy Burndine (2012-11-11). "Avengers Assemble!". The Avengers: Earth's Mightiest Heroes. Season 2. Episode 052. Disney XD. ^ Whedon, Joss (director); Joss Whedon, Jed Whedon and Maurissa Tancharoen (writer) (September 24, 2013). "Pilot". Marvel's Agents of S.H.I.E.L.D. Season 1. Episode 1. ABC. ^ Zinberg, Michael (director); Jeffrey Bell (writer) (December 9, 2014). "What They Become". Marvel's Agents of S.H.I.E.L.D. Season 2. Episode 10. ABC. ^ Tancharoen, Kevin (director); Jed Whedon (writer) (May 17, 2016). "Ascension". Marvel's Agents of S.H.I.E.L.D. Season 3. Episode 22. ABC. ^ Couch, Aaron (December 9, 2014). "'Agents of SHIELD' Bosses on Skye Bombshell and Marvel Movie Future". The Hollywood Reporter. Archived from the original on December 25, 2014. Retrieved December 9, 2014. ^ Abrams, Natalie (December 10, 2014). "'Agents of S.H.I.E.L.D.' reveals Skye's true identity -- what's next?". Entertainment Weekly. Retrieved December 17, 2014. ^ CS (December 6, 2016). "Agents of SHIELD: LMD and a Slingshot Digital Series are Coming". ComingSoon.net. Retrieved December 7, 2016. ^ Royce, Bree (September 21, 2016). "Marvel Heroes adds Quake, Ghost Rider team-ups; Mark Rubin joins Gazillion". massivelyop. Retrieved April 3, 2019. ^ "It's All Connected: The Agents of S.H.I.E.L.D. in 'Marvel Future Fight' - News - Marvel.com". Archived from the original on 2015-10-06. ^ "Piecing Together Marvel Puzzle Quest: Quake - News - Marvel.com". Archived from the original on 2016-05-14. ^ Paget, Mat (March 17, 2016). "Lego Avengers DLC Season Pass Detailed". Game Spot. Retrieved June 5, 2016. ^ Thomas, Leah Marilla. "Which Female Marvel Hero Needs To Be On 'Agents of S.H.I.E.L.D.'? Chloe Bennet Has A Few Favorites". Bustle=MArch 30, 2016. Retrieved March 3, 2019. ^ Michael, Bitton (August 16, 2018). "Marvel Strike Force Devs Charting a Better Path". MMORPG.com. Retrieved April 3, 2019. ^ S. Allen, Paige (August 13, 2018). "Marvel Rising: Initiation Review". IGN. Retrieved April 3, 2019. This page was last edited on 3 April 2019, at 19:48 (UTC).